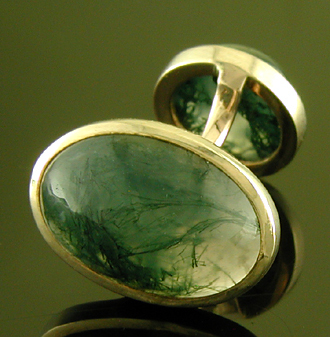 Elegant moss agate cabochons set in polished gold bezels. Moss agates are a mesmerizing variety of quartz that swirl with beautiful green strands reminiscent of seaweed floating in filtered sunlight beneath the ocean's surface. These cufflinks were crafted in 10kt gold, circa 1950. Moss agate is a fine grained variety of quartz with seaweed-like inclusions. The intertwined colors - ranging from dark forest greens to pale golden yellows and every shade in between - create fantastic verdant "seascapes" that rival the finest emeralds. 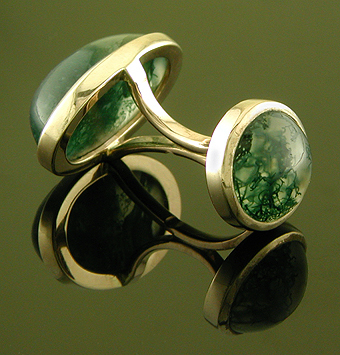 Moss agate was particularly favored in gentleman's jewelry in the late Victorian era and early 20th century. These cufflinks are finely crafted with sturdy split bridges securing the cufflinks on the cuff. The round backs complement the oval fronts with verdant moss agate cabochons. The bezels of the backs and edges of the bridges are gently rounded to ease their passage through a button hole. Although these cufflinks are not signed, the design of the bridges and quality of the craftsmanship suggests that the links were created by Larter Sons, a maker of fine cufflinks during much of the late 19th and 20th centuries. 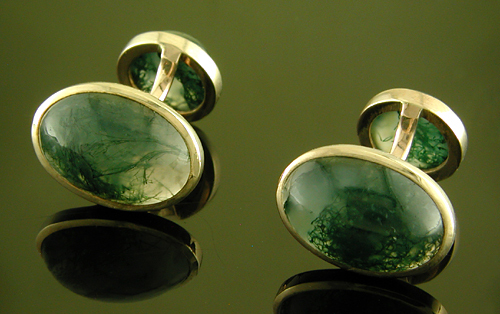 Measurements: These 10kt gold and moss agate cufflinks have 5/8" by 7/16" oval tops and weigh 6.4 grams in total.